In edition 260 of BC Disease News (here), we reported that Just Costs Solicitors Limited had entered into administration for the 2nd time in 2 years. 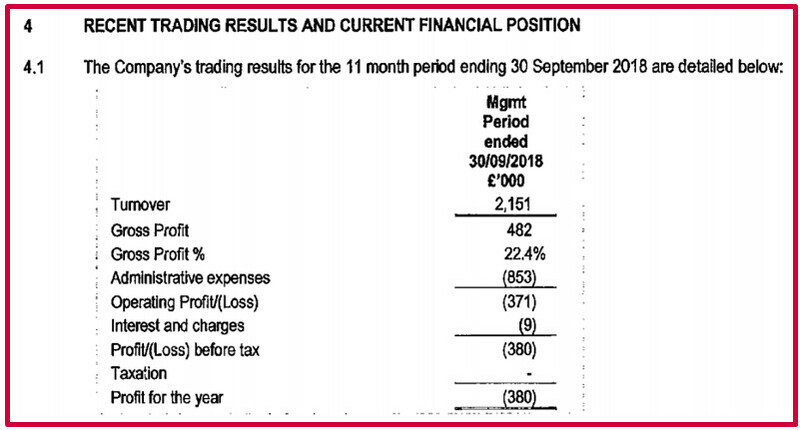 This reveals that for the 11-month period ending 30 September 2018, the company made a net loss of £380,000, despite turning over £2.151 million, as its gross profit (£482,000) was outweighed by administrative expenses (£853,000). Where did financial difficulties stem from and how did they arise? The notice refers to ‘significant cashflow pressures’ from the company’s incorporation, in October 2017, which were caused by legislative reform and slow receipt of debts owed. By the close of 2018, the notice explained that cashflow forecasts conveyed a funding shortfall upon future wage payments. When Leonard Curtis was appointed, Just Costs still owed £742,219 for the purchase of the business and assets of the acquired company (£316,268 to Just Costs Limited and £425,951 to Just Cost Budgets Limited and Just Costs Management Limited). What is more, as of November 2018, the company had fallen behind with its VAT, PAYE and NIC obligations to HM Revenue & Customs, totalling £262,000. Its landlords’ quarterly rent, due in September, had also been left unpaid and a notice to forfeit the lease was sent accordingly. Ultimately, the company has insufficient property to enable any distribution to the company’s 24 unsecured creditors. [i] John Hyde, ‘Creditors left penniless after costs firm fails for second time’ (9 April 2019 Law Society Gazette) <https://www.lawgazette.co.uk/practice/creditors-left-penniless-after-costs-firm-fails-for-second-time/5069923.article> accessed 11 April 2019.